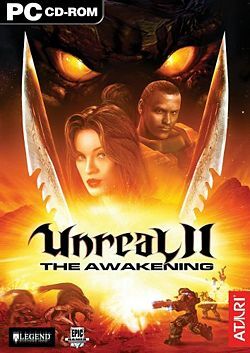 Unreal II: The Awakening is described as a sequel to Unreal, though many of the story elements, including characters and locations, are entirely unrelated to the original. The game was released to stores on February 4, 2003. Primary development on Unreal II was performed by Legend Entertainment, with some assistance by Epic Games, and published by Atari. After much delay, the Unreal II demo was finally released on May 1st, 2003. It included one level from the Single-player campaign. The Demo for XMP was released on December 5th, 2003 and included one map, XMP-Garden, out of the 8 maps included with the XMP addon. While Unreal II received above average review scores from most of the major game news outlets, it was not received well at all. The most common complaints were that, while it looked pretty, the game did not have much depth nor any replayability to speak of. The game did gain somewhat of a cult following sometime after the XMP addon was released, however this community focused more on the multiplayer aspect of the game, with the single-player campaign receiving very little time or attention. Most people dislike Unreal II in name only. The game had relatively little to do with the original game, including leaving out any characters, location, and most enemies from the first game. Some people agree that the game is fine as a game, but is not by any means a sequel to Unreal. Upon release, Unreal II utilized build 2001 of the Unreal Engine 2 (verify?). Upon release of the XMP addon, the game utilized build 2226. The game appears to use a different series of build enumerations from the base Unreal Engine, as the XMP release was described as build 6496, with patches to 6497 and 7710 (the latest patch). Jack Wall (Tommy Tallarico Studios), Clint Bajakian (Tommy Tallarico Studios), Jeremy Soule (Artistry Entertainment), Crispin Hands (Artistry Entertainment), Brian Min (Weddington Productions), Chance Thomas, Richard Schneider and original Unreal composer Alexander Brandon are credited for working on the music in Unreal II. Most of the music files of Unreal II use DirectMusic, and only the cutscenes use OGG Vorbis format. There are some additional music tracks that were not used in the game. Overall the music is very cinematic and uses much effects. Na Koja Abad Fight loop 2 M03_fite_loop2 Na Koja Abad fight theme, also used in Ultimate Community MapPack 2 of UT2004 (as UCMP2-MercFight). Note: they have .con extension and needs special software to play. The base game of Unreal II is a single-player mission. A multiplayer addon was released in December 2003, known as XMP (eXpanded Multi-Player). The single-player maps are included in the base game of Unreal II. The XMP maps are included in the XMP addon. Avalon (preface) TutA, TutB The first map. Here you can take a practice session of Unreal II, called Refresher course. Sanctuary M08A1, M08A2, M08B A jungle island Elara V, where Liandri Mining Corporation has a mining facility Lima Six. An artifact was discovered there. Swamp mm_marsh Elara V (or Sanctuary) again, now in the jungle after a ship crash. The player has to help the Marines here. Hell m01a, m01b, m01c, M01d A cold moon called Hell, where the Axon corporation established a research facility. An artifact was found there, as well as genetically modified creatures. Acheron m06_acheron A living planet, where Izanagi corporation discovered an artifact. The planet seems to have strange biological defense functions. Severnaya mm_waterfront A planet where Izanagi built a dam. The Marines have attempted to blow the building off, but not successfully. The explosive charges remain there. Kalydon m06_obolus A planet where Axon established a repair facility. Liandri Angels are tracking the planet. Sulferon MM-sulferon A desert planet where Izanagi has a secret building that has information about artifact locations. Janus M09 A planet that is known for the Axon geological research station. Even two artifacts can be found there. Na Koja Abad M03A1, M03A2, M03A3 A planet that has hazardous atmosphere. There is an Izanagi research building that has discovered an artifact on this planet. It is known that even a few races have lived on this planet. NC962VII (The Drakk Hive Planet) M03B1, M03B2, M03B3, M03B4, M03B5 The planet that the Drakk come from. It has been changed a lot from it's original form by the Drakk. They have one artifact that is heavily guarded. Avalon M10-Avalon The first planet that it is seen in the first map, TCA headquarters. The Dorian Gray Starship M11, M12 The starship Dorian Grey of the TCA, owned by Sector commander Hawkins. Atlantis Interlude Atlantis The TCA Atlantis spaceship. This map is played after each of the missions, with some exceptions. Here you will find all the links to the downloads of the essential files for your Unreal II installation. Unreal II: The Awakening 1403 Patch - Fixes a variety of issues with the retail version of Unreal II: The Awakening. Also known as patch 2001. Not needed for Unreal Anthology. UK version. eXpanded MultiPlayer Full Version 7710 European version. However, this content isn't lost forever. Beta versions of Unreal II have survived, and eventually they will be released, bringing all of this content back into the main game. For more information, see the Cut content of Unreal II article. An additional map has been created by Matthias Worch, called Solaris Base. The action takes place between Hell and Acheron missions. This section is a stub. You can help Liandri Archives by expanding it. This page was last edited on 8 November 2014, at 17:10.